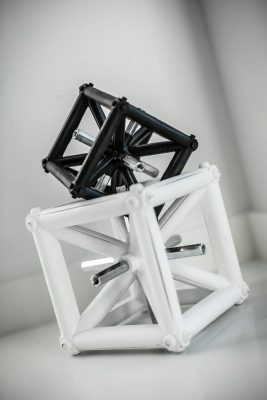 Foldable Exhibition Trussing: The Benefits! 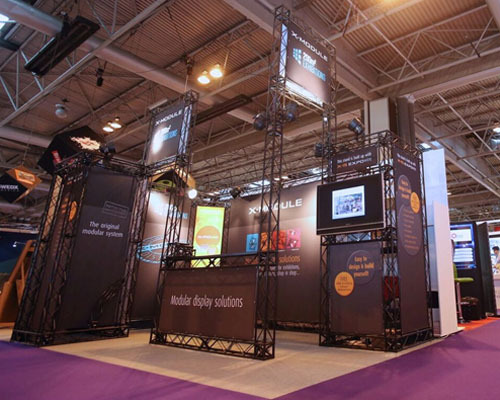 As one of the UK’s leading manufacturers and suppliers of trussing for exhibitions, stage shows and conferences, we often get asked what sets our products apart. There are many reasons why 200m2’s products outshine the competition but there is one aspect which is truly unique. Our fully patented X-20 TRUSSwire product is a foldable trussing solution, allowing easy transportation and storage! As a hinged trussing solution, TRUSSwire can be stored completely flat in it’s own durable carry cases. With a 20cm by 20cm profile when extended, TRUSSwire is extremely strong and robust. What’s more, it’s internal alumunium core and scratch resistant composite outer, make it lightweight yet extremely durable. TRUSSwire can even be used outdoors! Gone are the days when you need a large team of exhibition stand contractors to help you build and dismantle your stand. With TRUSSwire, you can set up even medium to large sized stands in under an hour! Simply unfold your stand from its container and fold it away again after the show. Folding exhibition trussing saves time and therefore money! Whereas most trussing is silver in colour (being made from aluminium or steel), our trussing comes in black or white as standard. In fact, depending on the size of the order, we can make trussing in virtually any colour! Match your trussing infrastructure to your brand colours! 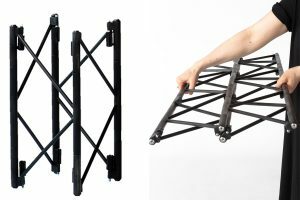 When assembled, our range of graphic display panels simply click into place between the trussing framework. Choose from a wide selection of materials and environmentally friendly inks. Add LED back-lighting panels to create stunning back-lit displays. A wide range of accessories complete the look: from TV screens and brochure holders to leaflet racks and reception counters. TRUSSwire can be scaled to virtually height or width! So when you’re planning your next exhibition, why not get in touch! With a wide range of purchase and leasing options, our modular trussing options are the perfect complement to your marketing programme. Previous Previous post: How to choose which trade shows to attend? Next Next post: Exhibition Stand Technology!